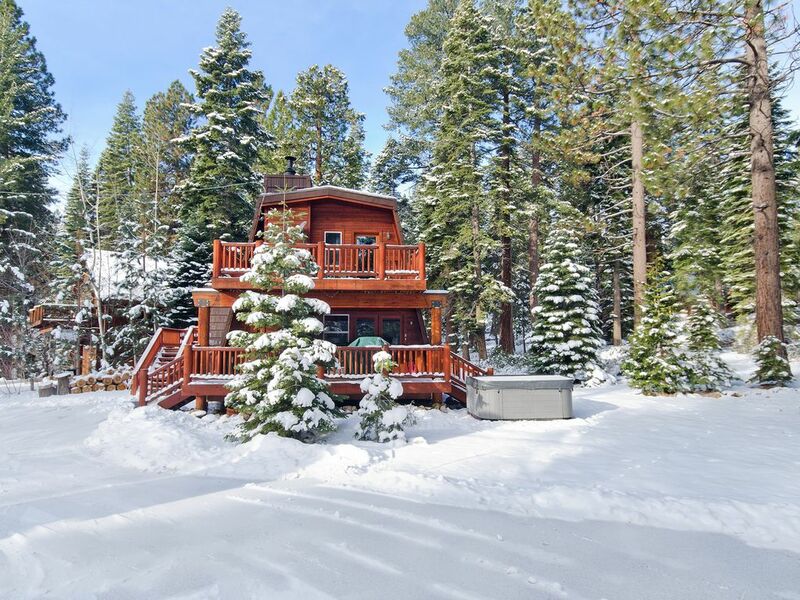 Clean, fun and bright 4 bed/ 2 bath/ 2 living room remodeled cabin located right across from Lake Tahoe. Peak lake-views, 2 decks, gas grill, indoor & outdoor bars, all new appliances, 2 TV’s, wood burning stove, WIFI, disco ball, 8 person hot tub, basketball hoop, flat large driveway located on SR 28 with parking for 5+ cars and/or trailers. Half a mile to our nearest beach, town, bars & restaurants- (Patton beach at Watermans Landing, Garwoods Grill and Pier, CB's Pizza, 711 convenience store all located in nearby Carnelian Bay. Squaw Alpine, Northstar, Diamond Peak ski & golf resorts are just a 15 minute drive from the house. Strike it lucky at or see great live music at the casinos in Crystal Bay, NV only a 5 minute drive from this property. -Bed configuration: 1 King, 2 queens, 2 twins. *Stereo (CD, Record player, FM tuner) with plug in zone for ipod. *Motorized disco ball with 2 spotlights in main living area. *Basketball Hoop in driveway (recommended for older children/adults due to location). Please request ball upon booking. *Short walk to nearby Carnelian Bay beaches & pier, convenience store and restaurants such as Garwoods grill & pier, CB's pizza and The Old Post Office. Sorry, Absolutley No Pets, No Smoking. 3-4 night minimum stay preferred during peak summer. 5 night minimum stay preferred for July 4th, Christmas & New Years weeks. All bookings require a $500 refundable security deposit. We took our family of nine to the Tahoe area for vacation and were very pleased with this home. It was very clean and with plenty of room/beds for our clan. The sound system was great! We really enjoyed the outdoor space on these gorgeous summer nights. The road in front of the home is busy. It may not be ideal for those with young children but adults and older children will be pleased with this property. We had a great family experience and would certainly consider staying here in the future. The house is very well equipped for cooking and dining, and it even has a good sound system and fun party lights. It is close driving distance to lakeside tourist amenities. Only downside is traffic noise from the very busy Lake Boulevard. Fun house with great character in a great location. Definitely recommend staying! I've stayed here three times, and it's been wonderful every time. Sinead is a great host, the house is amazing, and everyone has had fun. I couldn't be happier. My family and I stayed for the weekend and loved the home! It was in a great location; 10 minute walk to the lake and nearby stores. The rooms were cozy. We spent most of the time in the living room and dining area which were very comfortable. Sinead was a great and caring host that tried her best to accommodate us. Also, the parking was perfect! My family and I will definitely be coming back! Sinead was very easy to reach and very organized. The cabin was such a delight to me and my friends! We are located on SR 28 which is the main road the circles around Lake Tahoe. Traffic and road noise should be expected but is not bothersome as the house and yard are somewhat set back from the road. Please ask us more about our location especially if you are traveling with young children/toddlers.